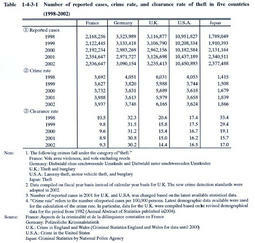 Table 1-4-3-1 shows the number of reported cases,crime rate,and clearance rate of theft in five countries since1998(see Appendix1-14 and 1-15 ). In2002,Japan showed the lowest clearance rate and the second smallest number of reported cases following France.Reported cases and clearance rate increased throughout the period in Japan whereas they fluctuated in other countries. The clearance rate in Germany and U.K.showed a downward trend throughout the period whereas it increased in France,U.S.A.,and Japan in2002.